Well, outside of the Church, not many. (Okay, let’s be honest, even most Catholics today don’t talk about virtue.) In general, talk of being virtuous has been replaced by talk of having “values” — even though virtues and values are not synonymous. “Values” are simply, well, what one values. We all have them. They are beliefs, ideas or priorities that are special and important to a person. Values are subjective, and they are not based on the concepts of good and evil, or right and wrong; rather, they are based on personal preference, choice and emotion. Even unrepentant killers, narcissists, and the devil himself have values. Virtues, on the other hand, are based in objective morality. The very word, virtue, means “moral excellence” and is defined as the habit of doing good and avoiding evil. As St. Augustine said: “Virtue is a good habit consonant with our nature.” So, while everyone has “values,” not everyone is virtuous. To illustrate the difference, let’s play out the scenario of a daughter (my daughter!) bringing home a man of “values” vs. a man of virtue. Daughter [excited and giggling]: Mom, Dad, I want you to meet Fritz! He is just awesome, and he has so many values! He’s spent a lot of time going through “values clarification” exercises in school, from elementary all the way through grad school, so he has learned to “choose, prize, and act upon” the following things that make him feel great: Being popular, making money, looking good, being comfortable, and enjoying sensual pleasures! * Oh, Mom, Dad, don’t you love him? Daughter [excited and giggling]: Mom, Dad, I want you to meet Athanasius! He is so awesome! He was raised to have the habit of virtue, and thus is incredibly virtuous! He is patient and humble, chaste and temperate, courageous, just and merciful. He is prudent in all he does and has incredible fortitude. He is joyful, generous, understanding, faithful, and has amazing self-control! He is also modest, peaceful, hopeful and reverent. And, he has such love! Love for God above all, me next [giggle], and for his fellow man! Mom, Dad, he is what real manhood is all about! Don’t you love him? Moral of the story? 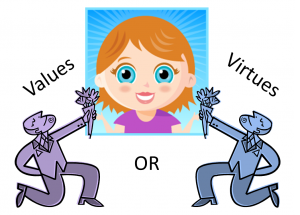 The difference between “values” and virtues could be the difference between my daughter bringing home a narcissist or a hero. So my hope (plea?) is that we Catholics would bring “virtue” and “virtuous” back into our everyday vocabulary and to the front of our minds. It shouldn’t seem strange to say the words, nor should it be old-fashioned to live the life. In fact, in this confused, disconnected, disordered world of “value-neutral” values (irony? ), I’m thinking that to quite a few lost and wandering souls out there, the rediscovery of virtue might be like a cool drink of water to a parched and dying man. *All these “values” were found on “values clarification” exercises on the Internet. Leila Miller is a wife and mother of eight children, with a penchant for writing and for teaching the Catholic Faith in simple ways. She also loves to debate atheists and advocate for special needs orphans (not necessarily in that order). All of the above is accomplished on her two blogs: Little Catholic Bubble and Orphan Report.